Hot this week: Egypt discussion and Egypt repatriations. Discusses how structural elements of the present art market and legal regime that ‘governs it’ is related to the production of fake paintings. A profile of Mr Ben Baluri Saibu, Senior Private Legal Practitioner in Tamale, calls for public awareness to help save Ghana’s artifacts. Includes offhand accusation that MINURSO ‘peacekeepers’ have been looting desert sites for antiquities. 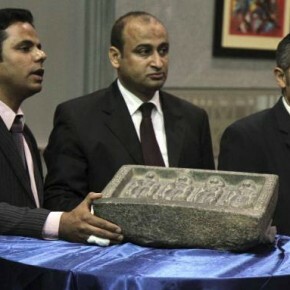 Three Egyptian objects seized in 2009 at Stuttgart Airport on their way to Belgium are being returned Egypt. An article that cites what I can only say are unsupportable figures for the ‘value’ of Egyptian antiquities smuggled since 2011. Quite large and no source of info cited. I can’t imagine a source being possible. Otherwise about a possible antiquities MOU between the US and Egypt. Undercover agent meets with head of smuggling gang in Cairo. Recover 10 pieces from the museum. Included is a statue of Tutankhamen and ushabtis of Yuya and Tuya. At this point 44 out of 54 stolen museum items have been returned. Pre-2011 security walls were built at some Egyptian sites. This article implies that because there are no security walls at Deir el-Ballas, it got looted. I am not convinced. Does discuss a recent theft at the Open Air Museum in Luxor and a gang trying to sell artefacts at Faiyum. Audio and text about Monica Hanna. Tess Davis and Blythe Bowman discuss recent cases of looting and trafficking of Egyptian cultural objects and advocate for a Memorandum of Understanding between the US and Egypt. Robyn Sloggett of the University of Melbourne asserts that the looted idol scandal should force Australia to re-assess acquisition policies. As you probably know, the National Gallery of Australia has accepted the Indian claim of ownership of a Chola-era Nataraja that they paid $5.6mil for. It was stolen from a temple in Tamil Nadu and smuggled by disgraced dealer Subhash Kapoor. Farmer finds 15th century coins while tilling a field in Kirmiri village, Gondpiperi tehsil. Police seized the finds after news spread. Makes the odd claim that the US is trying to return stolen idols but India is not interested. Grain of salt. Upcoming return of stolen ancient statue from National Gallery of Australia should have an effect on the trial of its smuggler. Successes in the return of looted Cambodian sculpture with hope that these returns will inspire returns to other countries. Transcript of a news segment about the US return of Joseon Dynasty seals that were taken by US soldiers. This is quite an interesting case. A Korean statue is in Japan, it is stolen by Koreans and brought to Korea for illegal sale. It is seized, but then it is kept in Korea because it is asserted that Japan shouldn’t have it in the first place. Iranian police seize a supposed Picasso on the border between Iran and Azerbaijan. Smugglers were attempting to sell it for $900,000. Minister states he is working on a new law to protect archaeological resources. A Culture and Tourism Ministry lists the objects in foreign collections that it attempted to have repatriated last year. A meeting was held in Nicosia between relavent ministers of Georgia and Cyprus concerning the implementation of a cultural property protection Memorandum of Understanding between the two countries. Heirs will not get a collection of artworks that were seized from a Jewish-owned button factory in 1939. Lord Colin Renfrew reflects on the sad history of the looted ‘Sevso hoard’. Turkey has renewed its claim to the marble head of a Eros now in the Victoria & Albert museum. The head comes from the Sidamara Sarcophagus, which is in Istanbul, and was sold in London in 1883. The V&A indicates that they would be willing to send the head to Turkey on ‘long term loan‘. Two Olympic gold curling medals, one recent and one a first gold curling medal from 1924, were stolen from the Dumfries museum as were other curling medals. The Arts Council threatens to revoke Northampton Museum’s accreditation if it sells an ancient Egyptian piece, saying that it is against public trust to ‘dispose’ of objects in a public collection. Collector Eskandar Maleki is suing his former art advisor Amir Shariat for taking undisclosed commissions for the sale and purchase of art. Maleki is countersuing for defamation. A statue suspected of being stolen from the village of Madhya Pradesh, India, and trafficked by Subhash Kapoor is in a US customs warehouse. It is valued at $15 million USD. A photo album owned by Adolf Hitler of art looted during WWII is being given to the US National Archives in May. Another piece by Tess Davis in which she discusses the Foreign Cultural Exchange Jurisdictional Immunity Clarification Act which would allow American cultural institutions to block legal claims to artwork on loan from abroad. A surprising 4858 Ecuadorian antiquities (I presume they were small pieces like loom weights etc) were returned by Italy. They had been discovered in three cases in Genoa it seems. The Mexican House of Reps has approved modifications to the country’s heritage law which now allow a maximum sentence of 12 years for trafficking archaeological objects. This article draws a parallel between the zodiac sculptures, which are based on looted antiquities, and Mexico’s history of looting and repatriation requests. It is interesting that the Ai Weiwei exhibition will be in the Museuo Nacional de Antropología, not in a modern art museum. The author of this piece has first-hand reporting experience with major looting cases in Central America. Painting by Jean-Paul Riopelle owned by a Winnipeg dealer was stolen from a Toronto Gallery. Painting was then seized in Montreal. More on the astounding Tillman case. Art dealer Hillel Nahmad to be sentenced for illegal gambling charges. Daniel Swallers, who is accused of stealing brains and other samples from medical museums in the US to sell on eBay, also appears to have stolen surgical equipment from a hospital and skeletons, an operating table, and a casket. Utah man accused of stealing a dino print and then tossing it off a bridge into the Colorado River says he is not guilty. No motive has been described in this case yet but I can only assume it was sale.